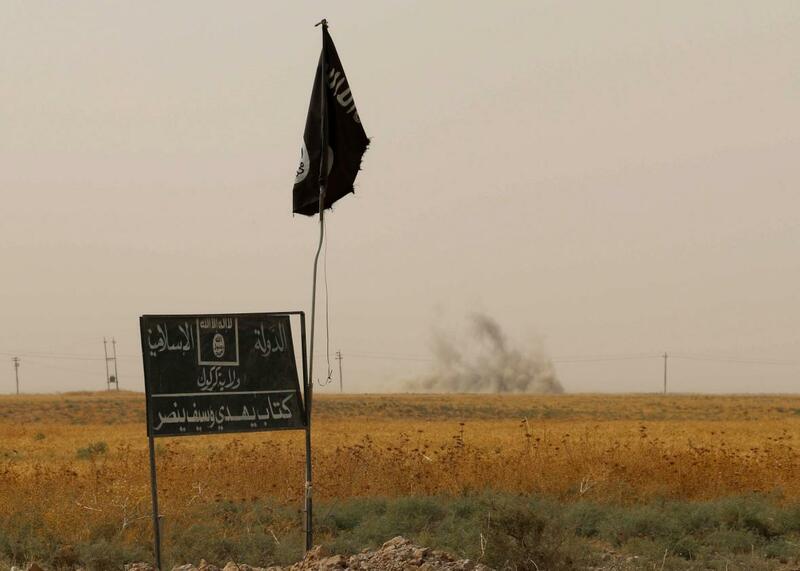 Smoke rises in the distance behind an Islamic State (IS) group flag and banner in northern Iraq on September 11, 2015. At least 58 former ISIS fighters have publicly spoken about their defection from the group. That’s a miniscule number of the estimated tens of thousands of fighters who have joined ISIS, but the motives of the men, and a few women, have left ISIS reveal some distinct trends according to a new report from the International Center for the Study of Radicalisation at King’s College London. Most notably: Many abandoned ISIS after being asked to kill other Sunni Muslim rebels instead of Bashar al-Assad’s forces. Since it first emerged on the scene around 2013, ISIS has differentiated itself from other Syrian rebel groups by being more interested in expanding its territory and constructing its “caliphate” than toppling Assad. In fact, in addition to some evidence of direct collusion between ISIS and Assad, at the very least, ISIS’s emergence has benefited the Syrian regime by forcing the rebels to fight a two-front war and making western powers more reluctant to pour money and weapons into the conflict in Syria because they are instead pouring weapons and money into the fight against ISIS. Some objected to ISIS’s disregard for the killing of civilians and execution of hostages, but these objections had less to do with the level of violence—for some recruits, that may be a benefit—than the targets. “None of the specific episodes that were highlighted by the defectors involved minorities or others that could be seen as ‘apostates’ or ‘infidels,’” the report notes “The only brutality that the majority of defectors objected to was violence against ‘Muslims’ – that is, Sunni Muslims – whose rights they believed should have been protected.” A smaller number of defectors were also turned off by what they saw as corruption or hypocrisy among senior ISIS members and by the harshness and austerity of life in the Islamic State, which can differ sharply from the idyllic portrayals in the group’s online propaganda. While the numbers are still small, the good news is that they’re increasing: Of the 58 known cases of ISIS defection between January 2014 and August 2015, 60 percent have been in the last 8 months and a third in the last three months. There are also likely many more returnees who haven’t gone public, for fear of reprisal from the group, being ostracized from their communities, or legal consequences from their own governments. The report is meant to aid efforts to counter ISIS’s propaganda machine—efforts that have had limited success so far. As for ISIS, it has been attacking Syrian military targets more often lately, so perhaps discontent in the ranks is starting to drive the group’s strategy.